"Turn on your voice soon as you get any chance" in the words of Freeway. You have to find what makes you, you. The longer you wait to make that discovery the harder and less likelier you are to find that treasure. 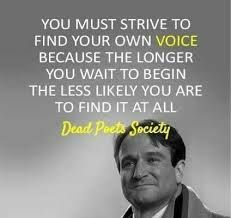 For more life gems like this check out the 1998 film "Good Will Hunting" starring Matt Damon and Robin Williams, until next week.